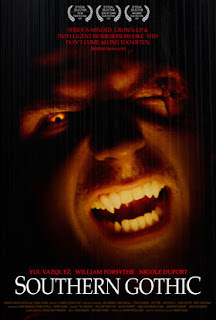 Vampire Beauties: Vampiress Review: "Southern Gothic"
The Gist: After falling for a stripper a guy must rescue her from a brood of vampires who have taken over the club she works and plans on making her their newest member. Clarification: This is a very dark film with kind of an awkward not so realistic story that revolves around a random guy babysitting a womans daughter so that she could strip at night. The guy and the daughter end up hitting it off very well all the while mom is being stalked by the head of a group of vampires. When she doesn't come home one day he goes off looking for her leading to a "way too much work in order to save someone you don't really know in a situation you really didn't need to be in" plot. Selling Point:A decent amount of horror when the film isn't being bogged down by the "Absentee step dad" plot. Female Vampire Factor: So in the will she or won't she category the main female of the film Starla (Nicole Duport) does end up a vampire by the films end. other than this there isn't a lot of other female vampire action in the film other than one brunette towards the films beginning. And a blonde stripper school girl who tries to seduce the hero of the film during his big rescue attempt. It's an OK film which does come off pretty stereotypical if you've watched a lot of independent vampire horror films as it's one of those films that goes more for mood and shock than it does substance. I give it a Vampire Beauty Rating of 3 out of 5.